Wittenstein Cyber Motor recently launched a series of small servomotors with an integrated screw for use in dynamic positioning axes, especially when the machine has to be installed in a confined space. The screw drive, fully integrated in the actuator housing, makes this series of servomotors so unique: the servomotor, spindle drive, linear guide rail, and encoder system form a closed, highly integrated, and ready-to-mount unit. The series is offered in four sizes, each with two different screw pitches and two stroke lengths for short or long-stroke applications. When combined with the servo regulators in the Wittenstein Simco drive series, these motors can be configured as complete small servo axes with multiple fieldbus interfaces for connectivity to the automation environment. The servomotors can be configured with Simco drive servo regulators to form high-performance small servo axes. 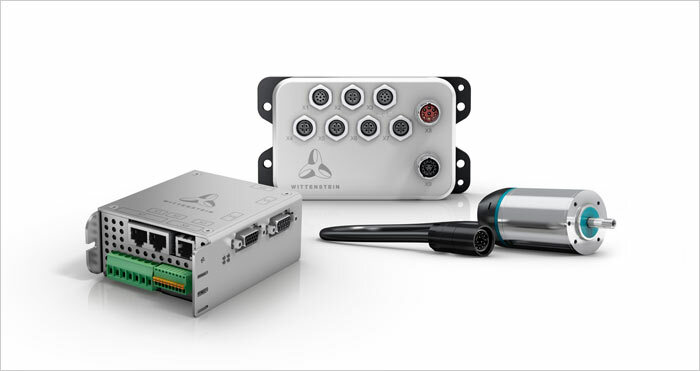 Multiple connection options are available for these solutions, which can be integrated in a higher-level controller via CANopen, Ethercat, Profinet RT/IRT, or Ethernet/IP. At the same time, this single-source system solution entails no interface risks and has an electronic identification plate that reduces the time for commissioning. The end positions are automatically limited, preventing the actuator’s mechanical stops from being approached dynamically. By selecting the electronic homing mode, the machine operator can define any zero position and home to it freely. The servomotors have an integrated screw and are permanently lubricated, so that no maintenance is required. They are used, for instance, for positioning, joining, bending, gripping and dispensing in reshaping and handling applications, the semiconductor industry, packaging machinery or assembly automation. The stainless steel design with IP65 protection also enables numerous applications for the linear actuator in food and beverage plants, such as in highly precise bottling lines. Each of the four sizes (outside diameter 17 mm, 22 mm, 32 mm, or 40 mm) achieves excellent acceleration values, cycle rates, and machine throughputs in a small space. This is due to the compact design, which results in lower mass inertia than is possible, for instance, if the screw is simply attached to the servomotor. The screw itself is maintenance-free with an anti-rotation mechanism and fits inside a closed thrust tube. The spindle drive and reinforced bearings allow both a tensile and a compressive force to be applied. An absolute single-turn encoder system with 12-bit resolution is available for all sizes. If the 32- or 40-size is installed, the functionalities of an integrated multi-turn encoder can additionally be implemented. All sizes are designed using EMC shielded single-cable technology, which is suitable for cable carriers. Unlike pneumatic cylinders, the linear actuators permit precise and flexible position control regardless of the application without any retooling on the machine. They are thus suitable whenever frequent format changes are required. The servo technology offers better controllability by design; together with the connection to a higher-level controller, this facilitates reproducible processes which can be either stroke or force optimized. The actuators are leak-proof and more energy efficient in normal operation because compressed air is not only expensive to produce but a significant share of it is lost. Finally, servo technology is virtually maintenance-free and also quieter.